The Sloppy Cook: Challenge #1 - Literary food. 'Meat pie', or Pastej af stek. 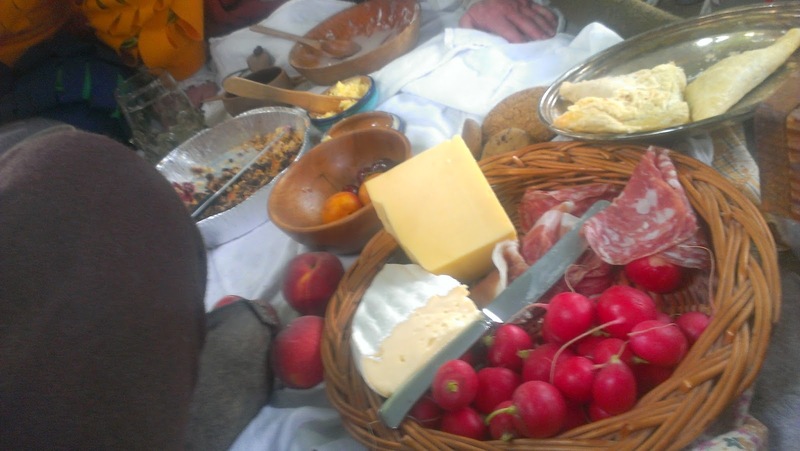 Challenge #1 - Literary food. 'Meat pie', or Pastej af stek. 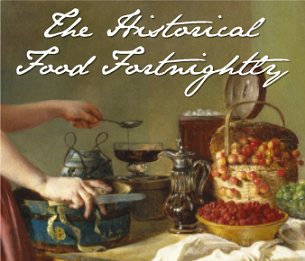 Literary Foods - Food is described in great detail in much of the literature of the past. 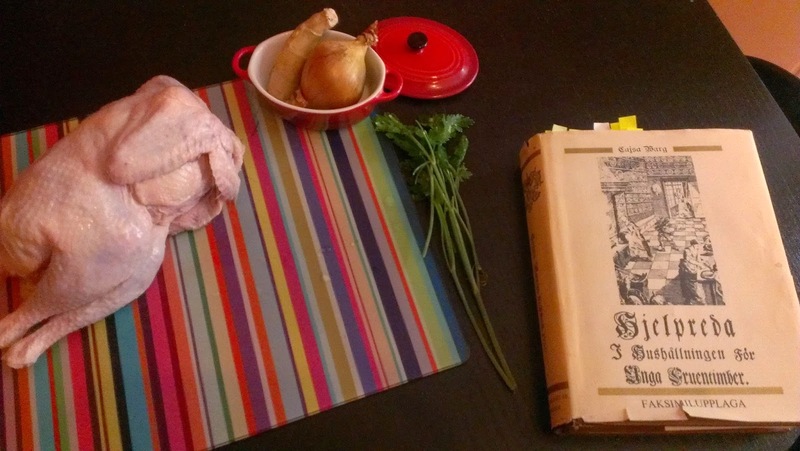 Make a dish that has been mentioned in a work of literature, based on historical documentation about that food item. For the short write-up, scroll directly to the bottom! Carl Michael Bellman (1740-1792) is perhaps as close as we get to a national poet in Sweden. His songs and poems are still well-known and sung here and are to me (and many others) a magical portal into 18th century Stockholm, to the gutters, public houses, bed chambers, pastoral picnics and all the other places Mr Bellman panted with words. A treasure indeed. I chose one of the many drinking songs that Bellman wrote as my inspiration for this challenge (Fredmans sång N:o 14: Hade jag sextusende daler/If six thousand dalers they gave me). This one is about all the things you could do if you, somehow, got hold of a lot of money. The persona in this song will buy a great house with tonnes of servants, hold magnificent parties, buy beautiful things, keep a beautiful mistress or two and gamble among other things - but more than anything else: drink, drink and drink! In the second verse below, something called Nubben's kräftpastejer (crayfish pies) are mentioned. That was my starting point. But minus crayfish. So, pies. Men framför allt så skulle jag dricka. (Martin Best recorded an English version of this song in the 1970s, but the verse with the pies is omitted from his version that is based on a translation by Paul Britten Austin. You can listen to the song on Spotify among other places). I'm going to be honest here! I force-fitted the following recipe into this challenge's theme. 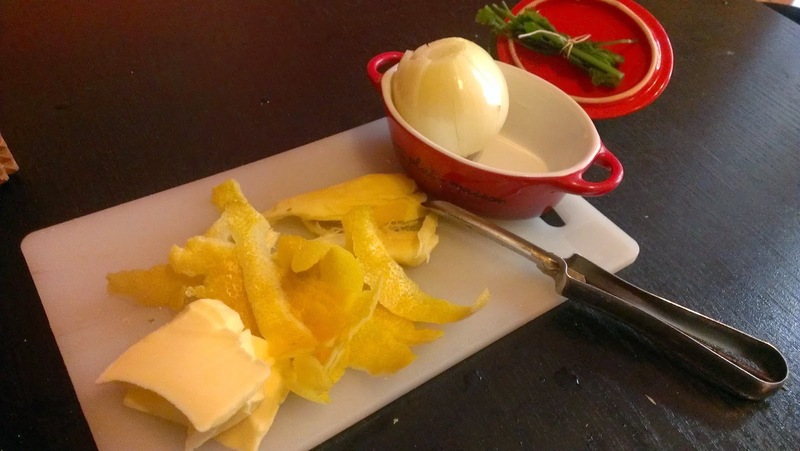 That is, I decided on the recipe first, and then tried to squeeze it into the theme. The key word here is pastej. In the Swedish language of today, pastej typically refer to a pâté-like dish. But back in the days, a pastej meant some kind of savoury filling inside a crust of dough baked in an oven - in other words: a pie. Funnily enough, the word pie is now used in the Swedish language (but spelled paj) and refers to both sweet and savoury pie dishes. 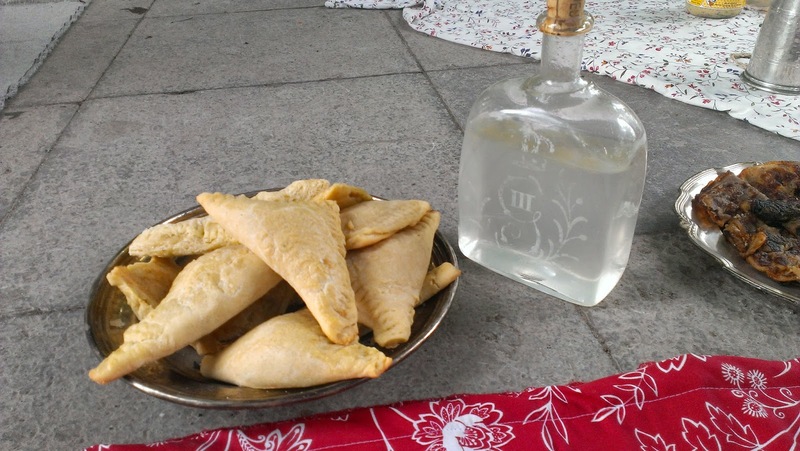 The reason for choosing a pastej/pie was that I was going on a historically themed picnic on June 6th and I wanted to try a recipe suitable for picnic food: not messy, easy to transport and edible without too many utensils. Small, Pirozhki-like pies seemed suitable. 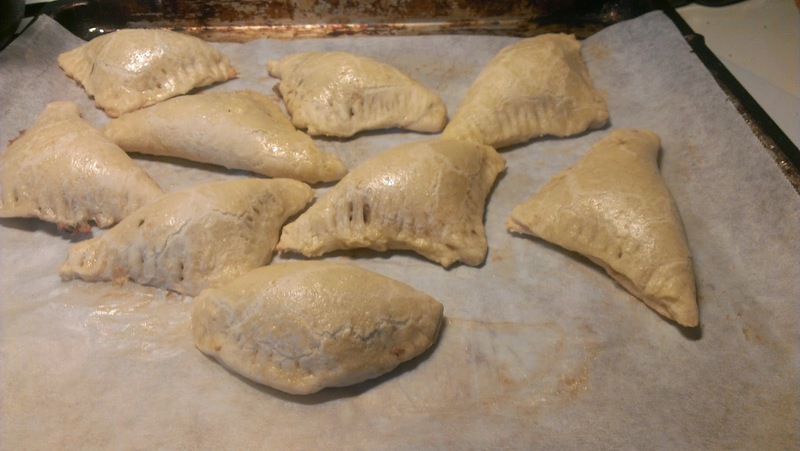 Pastej af stek, or (approximately), little meat pies. This is a recipe from a Swedish 1821 edition of an cookbook originally published in 1804 by Carolina Weltzin (who by the way had several literary connections; she translated novels and plays, wrote travel literature besides several works on cooking and housekeeping. And not least, Carl Michael Bellman dedicated one of his most beloved songs to her). The recipe called for any sort of left-over meat: beef, veal, lamb or hen. When you have cold leftovers of meat, whether it is beef, veal, lamb, or hen, chop it fine, melt butter over the fire and add some flour, finely chopped onion, lemon peel and parsley, stir it together over the fire, and add the chopped meat, some wine, gravy, if you have, or stock, a couple of egg yolks, mace, salt and grated bread, and stir well over the fire, and let it cool. Then you take puff pastry, do not make it too thin, and put it into small mould; put some of the filling therein, and cover with a lid of puff pastry or strips of puff pastry laid out in a grid pattern and bake in the oven. You may also bake them without moulds if you take squares of pastry, put some of the filling thereupon and fold the rest of the pastry over and seal with some egg; thereafter they are baked in the oven. I didn't actually have any leftovers on hand, but I did have a small hen in the freezer so I decided to cook it and pretend I had. 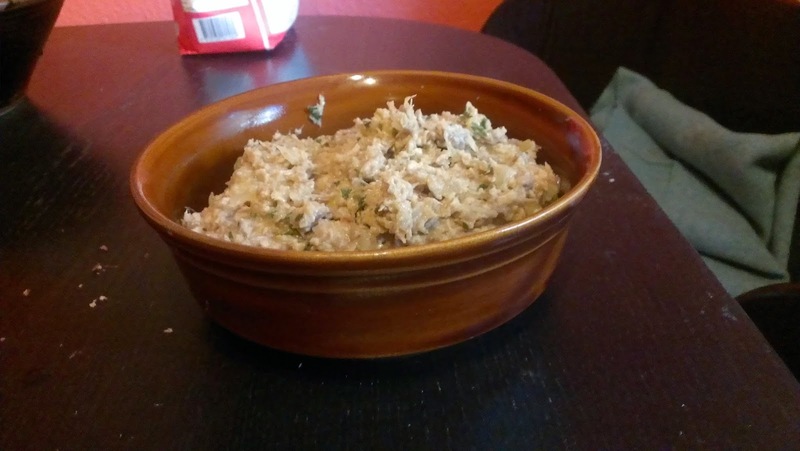 I wanted to prepare the hen in a somewhat period manner and looked in an older cookbook (Cajsa Warg; see sources below) and found a recipe for hen fricassee. I followed the directions for the first half of that recipe, which was to let the hen boil/simmer in water with crushed ginger, butter, lemon peel, a whole onion and parsley. Not too complicated, and tasty! I let the hen boil/simmer for nearly three hours - I had planned on ~2 but forgot about it! At least the meat wasn't chewy... I picked all the meat from the bones and put it in the fridge over night. 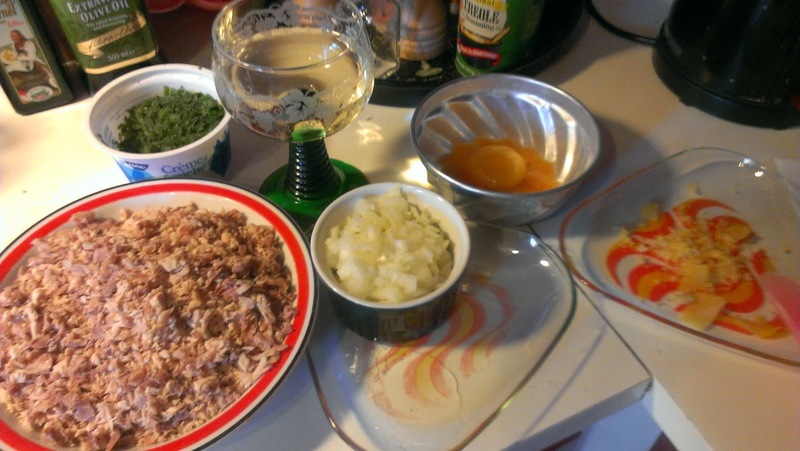 Most of the ingredients for the pie fillings can be seen below. I used some home-made chicken stock I had stashed away in the freezer instead of 'gravy' (because I had no idea what kind the recipe referred to) and white wine. I used store-bought bread crumbs as well, since bread rarely have the chance to go stale and dry in this household. But it was very tasty! A flavour of lemon was quite distinct and made it taste fresh and a bit tangy (I think the wine helped as well). I was very pleased so far. While the filling cooled off I made the dough and here I strayed away from the recipe. It did call for puff pastry, and the cookbook had a recipe for that, but I haven't made a proper puff pastry from a modern recipe ever, and I wasn't sure if I was going to be successful with a historical one (that also was quite different from modern recipes). I know that making a good puff pastry is labour intensive and takes many hours. I didn't have the time, the skills or the inclination, to be frank. 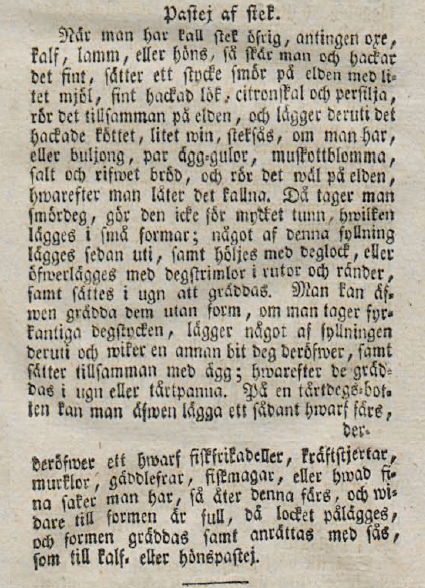 So I went to another early Swedish cookbook from 1802 (by Anna Maria Rückersköld; see sources below) and found a recipe for a dough that was recommended for pies. It looked a lot less complicated than a puff pastry, and the author added that it was a lot easier to digest than the former! So, yeah, that was totally the reason for using this recipe instead! Take 1 mark (212,5 gram) flour and ½ mark unsalted butter and when it is well worked together make a hole therein and add three eggs and work them into the dough and splatter cold water thereupon, a little at a time, until the dough is rather hard, then it is worked until it is tough. That didn't sound too bad, but I'm not sure how successful I was. Maybe the eggs were too large, but the dough was far too sticky as long as I followed the recipe. I had to add quite a bit of flour to make it resemble a functional pie dough, and I'm still not sure that I would call it tough but it seemed to work. I let it rest in the fridge for appr. 30 minutes before I made the pies. I used the method mentioned that didn't call for moulds and took ca. 12X12 cm squares of rolled out dough, filled them up, folded over with some egg between the edges and sealed them up by pressing down with a fork. I forgot to take any pictures of this, but they pretty much looked the same before and after their time in the oven (I baked them for 10-15 minutes, I think). I know that poor craftsmen blame their tools, but my oven is terrible at it's job. I love my gas-top stove but I hate the gas oven that's part of the deal. All heat comes from below which in reality means that everything baked in the oven will look unbaked on top, and slightly to very baked on the bottom-side. So this is what I ended up with. No they don't look very appetizing. Unfortunately, I'm very used to that. BUT - they tasted very good, much thanks to the filling (the dough was alright but nothing to write home about, a bit dry and bread-y). I ended up with 13 little pies that I brought to the picnic and treated friends and strangers to and they were well received in spite of their unfortunate appearance. The Recipe: Pastej af stek/Meat pie from a 1821 edition of Carolina Weltzin's 1804 cookbook with the LONG title of: Ny kokbok. Eller Anwisning till en myckenhet nu brukliga mat-rätters tillredande; jemte ett bihang innehållande kunskaper om hwarjehanda hushålls-rön. Available in pdf version here. The recipe for the dough is from an 1801 edition of Anna Maria Rückerschöld's Den nya och fullständiga kok-boken[...] available as pdf here. 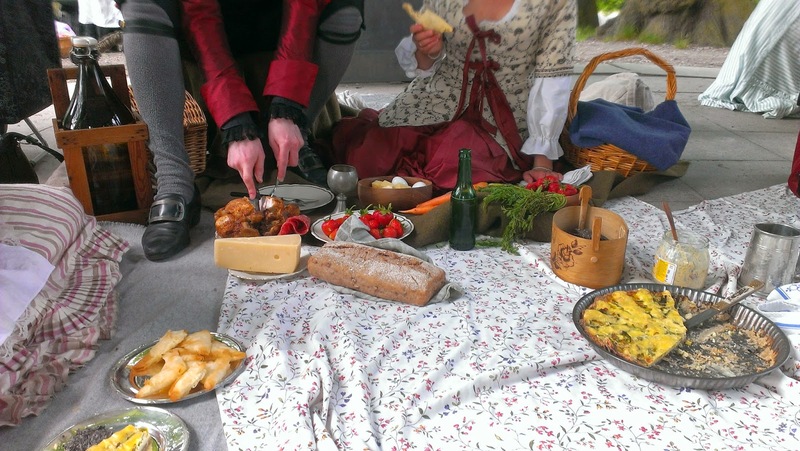 I also took a peek in Cajsa Warg's 1755 cookbook that unfortunately isn't available online. 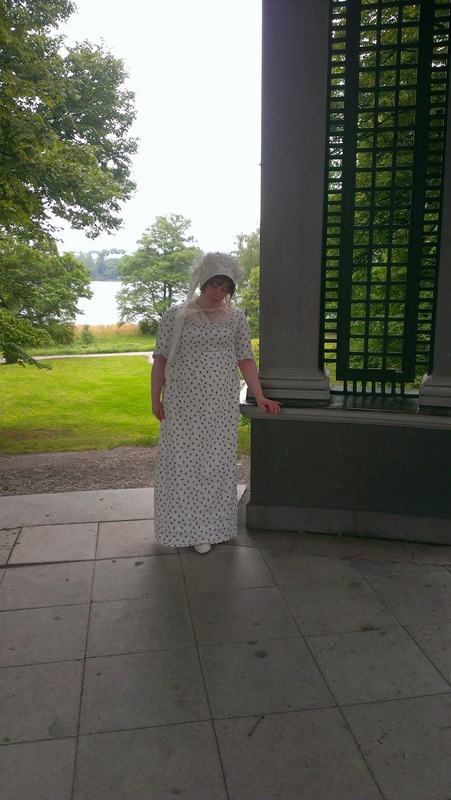 The Date/Year and Region: Sweden, early 1800s. 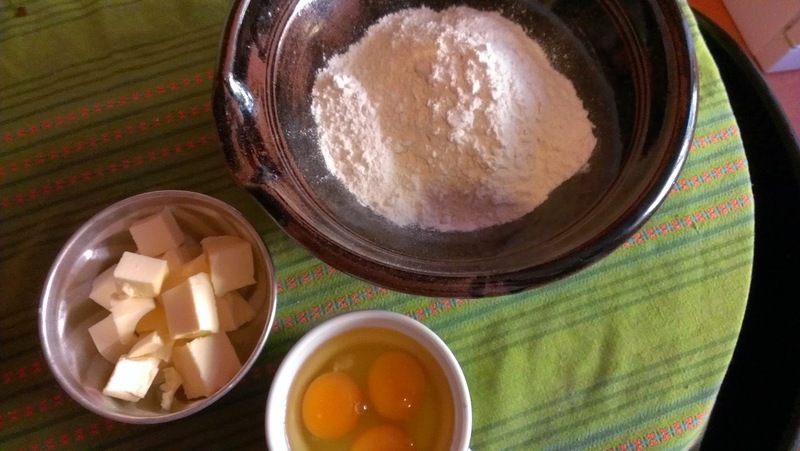 How Did You Make It: I made a pie dough of butter, flour and eggs and filled them with a mince of cold hen's meat, onion, parsley, eggs, wine, chicken stock and spices. They were made into small envelope-like pies and baked in the oven. Time to Complete: If you count cooking the hen, five hours? otherwise, perhaps two hours. Total Cost: I had most of the ingredients on hand, so not much; I consider this a rather cheap dish. How Successful Was It? : They tasted so much better than they looked! I was very happy with them, and my husband who is a very picky eater also liked them, which I take as a very good review. How Accurate Is It? : Not too bad, I think. I used store bought bread crumbs, but otherwise I think I used as good ingredients as I could considering this day and age. My gas oven isn't very period though. And it's a bad, bad oven. 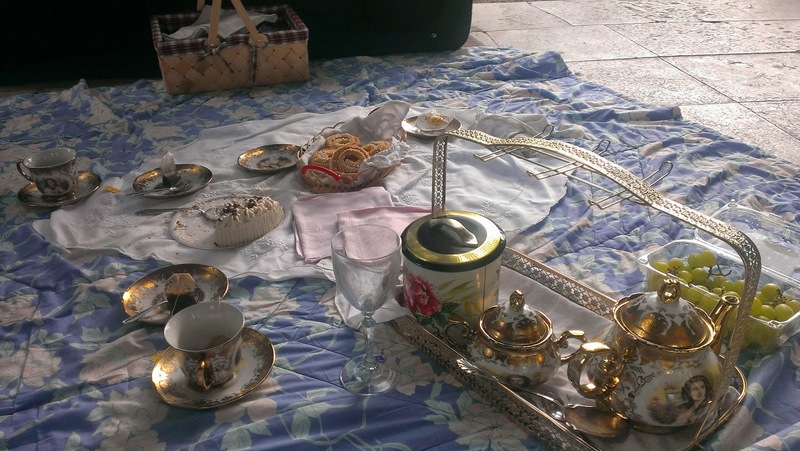 At last, some bonus pictures from the picnic! 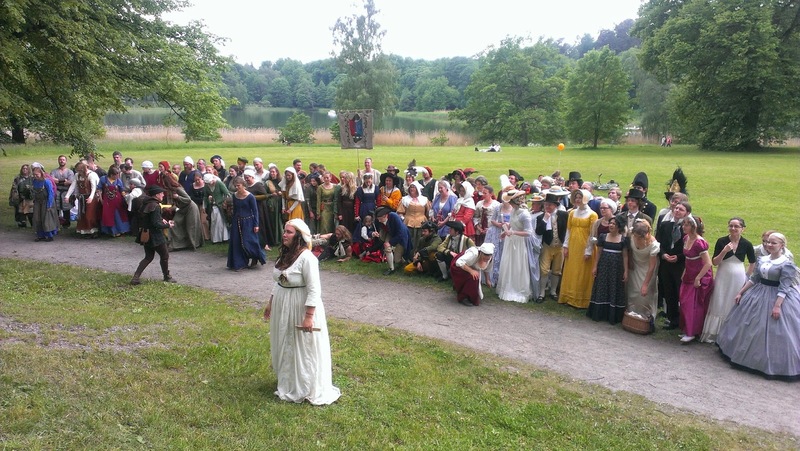 It was a huge multi-era historical picnic held on the national day in Sweden. Me. I chose clothes to match the food. Of course. Most of the guests posing for a group photo. 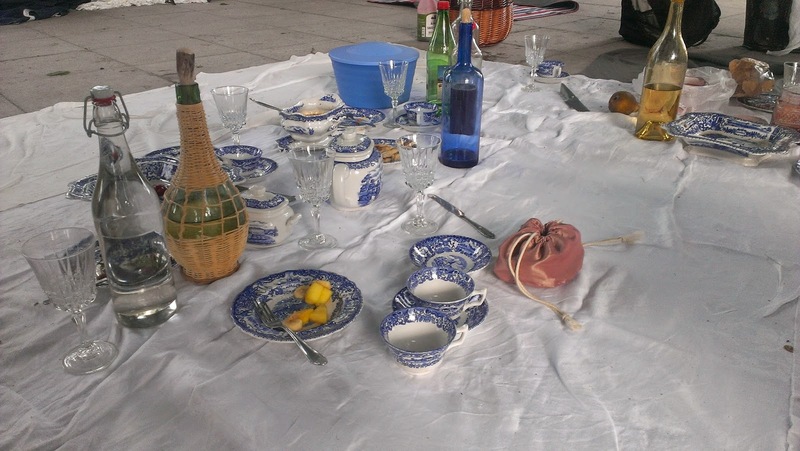 Minus the blue plastic bowl, this is a very pretty 'picnic-set'! Rückerschöld, Anna Maria (1801). Den nya och fullständiga kok-boken, innehållande beskrifning, at med mindre kostnad tilreda hwarjehanda smakliga rätter äfwen af potates, samt wälmenta råd och påminnelser, som jämwäl för bättre hushåll kunna wara tjenande, jemte bihang af et litet hushålls-allahanda [Elektronisk resurs]. 2. upl. Stockholm: Available online as pdf. Warg, Cajsa (1755). Hjelpreda i hushållningen för unga fruentimber./(C.W.) Stockholm, tryckt hos Lor. Ludv. Grefing, på desz egen bekostnad 1755.. Stockholm: page 189. Weltzin, Carolin (1821). Ny kokbok. Eller Anwisning till en myckenhet nu brukliga mat-rätters tillredande; jemte ett bihang innehållande kunskaper om hwarjehanda hushålls-rön. Af C. Weltzin. Fjerde upplagan. Stockholm, 1821. Tryckt hos direct. Henrik A. Nordström, [Elektronisk resurs] : på eget förlag.. Stockholm: Available online as pdf. A selection of Paul Britten Austins's English translations of Carl Michael Bellman's poems and songs can be read online here. Wow! That is quite the meal!